The April 2016 Keep Pearland Beautiful Business Beautification Award was recently awarded to Capital Bank East Pearland on Broadway. Capital bank has a history of maintaining a colorful landscaping. They have recently changed out their flowering plants to sun loving begonias. A committee made up of board members, volunteers and staff members nominates establishments with good landscaping practices that improve the appearance of our community. KPB runs this program with the support of businesses like ADDI Printing & Promotions LLC. If you wish to help sponsor this program and have your logo put on our sign please call our office at 281-652-1659. Learn more about KPB programs on our website: www.mykpb.org. The Law Office of Mark Smith, PLLC was awarded the February 2016 Business of the Month Award by the Pearland Chamber of Commerce. The business was founded in 2003 with the primary goal of helping people. Licensed attorneys provide high-quality legal services and business advice to small-businesses, entrepreneurs and non-profits. Offices are located at 1920 Country Place Parkway, Suite 350. Smith has been a licensed attorney in Texas since 1999. He has worked on both sides of the bar – representing plaintiffs in cases involving employment law, contract disputes, personal injury claims and other legal matters and businesses as general counsel. Since 2004, Mark has represented Harris County Emergency Corps (“HCEC”, formerly Harris County Emergency Services District No. 1), a premier EMS agency in Southeast Texas. During that time, he served as Vice President of Administration and General Counsel for the organization of 200+ employees and volunteers and serving more than 400,000 residents of Harris County. Since returning to private practice, Mark has added a number of small businesses to his growing practice, including Manvel EMS, Angleton Area Emergency Medical Services, Inc., Art & Kustom Kreations, the Wellness Integration Center, Deep South Builders, LLC and more. Smith is a native of Pearland, graduating from Pearland High School in 1990. As part of his commitment to Pearland, he provides a service through many of the area’s non-profit organizations including Pearland Rotary, the Pearland Foundation for the Performing and Visual Arts, Aggies Helping Others, the Outdoor Association for Texas Heroes (OATH), The 100 Club of Pearland and others. The Law Office of Mark Smith styles themselves as old-fashioned lawyers for the 21st century. That means they have old-fashioned values and 21st century skills. Learn how The Law Office of Mark Smith, PLLC can help at www.jmsmithlaw.com. Mario J. Garner, senior vice president and chief executive officer of Memorial Hermann Pearland Hospital in Pearland, will be inducted into the LSU Alumni Association Hall of Distinction as Young Alumnus of the Year during ceremonies at the Lod Cook Alumni Center on March 4. The Young Alumnus of the Year designation recognizes alumni under the age of 40 who have attained professional prominence early in their careers. Other distinguished alumni to be inducted are Roger W. Jenkins, president and chief executive officer of Murphy Oil Corporation; Sidney E. Fuchs, of Oak Hill, Va., president and chief executive officer of MacAulay-Brown, Inc.; Bernette Joshua Johnson, of New Orleans, chief justice of the Louisiana Supreme Court; and Frank P. Simoneaux, of Baton Rouge, attorney and former state cabinet secretary and speaker pro tempore. “I will forever cherish my years at LSU. It is the place where my road to adulthood began, my interest for servant leadership was heightened, my appreciation for the essentiality of friendship was strengthened and the trajectory for my career was established,” Garner said. Garner served as LSU student body vice president in 2001-2002 and graduated from LSU in 2002 with a bachelor’s degree in microbiology. He earned a master’s degree in healthcare administration from Tulane University and a doctor of education degree in administration and supervision from the University of Houston. Before joining Memorial Hermann in 2015, Garner served for two years as the inaugural president and chief executive officer of New Orleans East Hospital, overseeing the re-establishment of a full-service inpatient hospital to serve the communities that were severely damaged during the aftermath of Hurricane Katrina. Prior to that, he was chief operations officer at Fairview Park Hospital in Dublin, Ga.; chief operating officer/ethics and compliance officer at The Regional Medical Center of Acadiana in Lafayette, La. ; and associate administrator at West Houston Medical Center. Garner is a Fellow of the American College of Healthcare Executives and the National Association of Health Service Executives. He is a member of the LSU Department of Equity, Diversity and Community Outreach National Advisory Board; a guest lecturer for the LSU College of Science “Careers in Life Sciences” course; and a member of Omega Psi Phi Fraternity, Inc. He was an anchor/host of “Meet the Doctor” segments on WDIG TV in Dublin and hosted a radio talk show on WBOK radio in New Orleans. Garner has served the community as a Rotarian since 2011. He was selected for the Georgia Hospital Association’s 2012 Leadership Cohort. He currently attends Windsor Village United Methodist Church in Houston. Garner was recently named the University of Houston College of Education’s Outstanding Alumnus for 2015, listed among 25 Rising Stars in Healthcare under age 40 by Becker’s Hospital Review and received the American College of Healthcare Executives Robert S. Hudgens Award for “2015 Young Healthcare Executive of the Year.” Other recognitions include the WittKieffer’s Modern Healthcare “2014 Up & Comer” Award; 2014 City of New Orleans Outstanding Millennial in Healthcare; Omega Psi Phi Fraternity New Orleans Chapter 2014 Citizen of the Year; and Omega Psi Phi Fraternity Dublin, Ga., Chapter Omega Man of the Year for 2013 and 2014. He was inducted into Tulane’s Delta Omega National Public Health Honorary Society in 2010 and in 2006 was named an Ebony magazine’s Top 30 Leaders under age 30. The 2016 gala marked the 50th anniversary of naming and LSU Alumnus of the Year. The first award was conferred in 1966; the Young Alumnus of the Year Award was established in 1999. Including the 2016 inductees, the LSU Alumni Association has recognized 285 individuals representing a cross-section of LSU graduates. Southwyck Sec 1 HOA Pres. Cathie Tydelski and VP Gary Martin accept the January award. The January 2016 Keep Pearland Beautiful business beautification award was recently awarded to Emerald Pointe Subdivision off of Cullen Blvd in Pearland. Emerald Pointe subdivision has won this distinction twice before in 2011 and 2013. The colorful entrance to Emerald Pointe stands out at this time of year when other landscaping around Pearland is suffering from the winter grays. A committee made up of board members, volunteers and staff members nominates establishments with good landscaping practices that improve the appearance of our community. The committee is always open to receiving nominations from the community, so please email fwatson@mykpb.org with your nomination including the address of the nomination and for more impact please attach a few photos. KPB runs this program with the support of businesses like ADDI Printing & Promotions LLC. If you wish to help sponsor this program and have your logo put on our sign please call our office 281-652-1659. Learn more about KPB programs on our website www.mykpb.org. Keep Pearland Beautiful recently received the 2015 Affiliate Award of Excellence from the Keep America Beautiful national program. Keep America Beautiful is a national nonprofit organization that inspires and educates people to take action every day to improve and beautify their community environment. We envision a country where every community is a clean, green, and beautiful place to live. Keep America Beautiful nationally recognizes its partners and their volunteers for their efforts to create a more beautiful, cleaner, and improved environment through new technologies, improved waste handling and public space stewardship. Judges look at each affiliate’s activities in beautification and community greening, litter prevention and community revitalization, recycling and waste reduction, and environmental education for the award. Front row: Shirley Scholz, RN and Vance Riley; Back Row: Karen Pickard, RN, Jodie Harbert, Dr. Bobby Greenberg, Ryan Matthews, Dr. Jeff Beeson, Judge Mike DeLoach, Mick Click, RN. Missing are Linda Dickerson, Dr. Brian Eastridge, Dr. Alan Tyroch, Dr. Robert Vezetti and Nora Castaneda and James Williams. Pearland Fire Chief Vance Riley was recently honored for his 12 years of service on the Texas Governor’s EMS and Trauma Advisory Council (GETAC). Chief Riley has spent the last six years as the Chair of GETAC. In this role, he provided leadership and guidance to the other 14 Council members as well as the more than 150 subcommittee members serving on 10 different subcommittees. Riley was first appointed by Governor Rick Perry to the Council in 2004 at the recommendation of the Texas Fire Chiefs Association and then reappointed to the Council in 2010 in the position of Chair by Governor Perry. He also received a certificate from Governor Greg Abbott’s office in recognition and appreciation for his years of meritorious service the state of Texas as a member of GETAC. “It has been an honor, a privilege and a blessing to have served these dozen years alongside the most passionate and brilliant trauma surgeons, physicians, nurses and paramedics in Texas. I am humbled and grateful for the opportunity,” said Riley. GETAC was created by the 77th Texas Legislature in 2001 to: Review EMS and Trauma rules and recommend changes in those rules to the Texas Department of State Health Services; assess the need for emergency medical services in the rural areas of the state; and develop a strategic plan for: (a) refining the educational requirements for certification and maintaining certification as emergency medical services personnel; and (b) developing emergency medical services and trauma care systems (trauma hospitals) in Texas. To learn more about Pearland Fire, visit http://pearlandtx.gov/departments/fire. Tagged Awards, Pearland, Pearland Connection, Pearland Fire Dept. Congratulations to Officer DaSilva for being voted by your peers as Officer of the Quarter! The Above and Beyond Award recognizes officers who are active in the community, above and beyond their regular duties. Tagged 100 Club of Pearland, Awards, Pearland, Pearland Connection, Pearland Police Dept. Rep. Ed Thompson, representing Governor Greg Abbott, presented Pearland Fire Dept. Lt. Jason Corthell with an official Certificate of Recognition and a flag that had been flown over the state capitol on Monday (Dec. 7) before the City Council meeting. On March 27, Corthell was injured while battling an apartment fire in Cypress, where he volunteers for the Cypress Creek VFD, when he and other firefighters were trapped in a structural collapse. Corthell suffered a knee injury and took many months to recover. Corthell has spent most his adult life serving others. He joined the Cypress Creek Volunteer Fire Dept. in 2004 and soon after went to fire school at Lone Star Community College, where he excelled as a fire cadet. In 2006, Corthell joined the U.S. Marine Corps, where his station was air crash rescue. He switched to legal services, where he worked in the elite JAG offices. Corthell received an honorable discharge from the Marine Corps in 2010 and was hired by the City of Pearland in 2011. Corthell was promoted to Driver/Operator in 2013 and to Fire Dept. Lieutenant this year. Corthell received a standing ovation from the audience of citizens, emergency responders from all over the area and City leaders. For more information about the Pearland Fire Dept., visit PearlandTX.gov/Departments/Fire. Left to Right: Eddie Pearson, Chief Operating Officer, HealthStream, Rebecca Lilley, director physician resources, Memorial Hermann Southeast Hospital. Memorial Hermann Southeast Hospital was recently recognized by HealthStream with the Excellence through Insight award for “Overall Physician Satisfaction.” Memorial Hermann Southeast was awarded the honor with a physician satisfaction score in the 99th percentile for 2014. To qualify for the award, a hospital must have been a medical staff satisfaction client of HealthStream in 2014, scored at least in the 75th percentile or higher and conducted a minimum of 50 physician surveys. 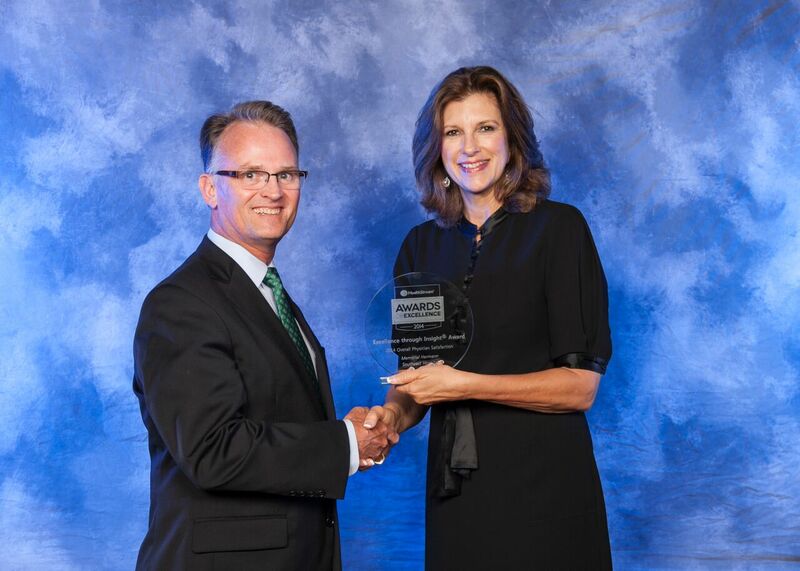 “We applaud Memorial Hermann Southeast’s high level commitment to excellence in healthcare and are pleased to recognize their achievement through our presentation of an Excellence through Insight award,” said Robert A. Frist Jr., CEO, HealthStream. Memorial Hermann Southeast is home to several award winning programs and specialties. Currently the campus is undergoing $14 million in renovations and improvements.